The team at DIY Crafts Mom LOVES all-natural products that help improve the quality of life and beauty. As a woman, having healthy, shiny, and beautiful hair is important and there are TONS of supplements on the market. Most of these products are filled with Biotin which is a common ingredient used in strengthening nails and hair. 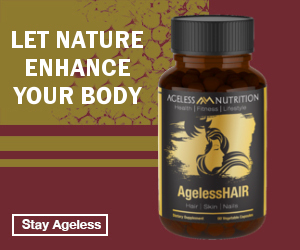 We came across a very unique all-natural supplement called AgelessHAIR – All Natural Hair, Skin, & Nails Supplement . We ordered this supplement and gave it a try to see if it really helped enhance our natural beauty. Here’s what we found. Premium Blend of Biotin, Horsetail Leaf Extract, Collagen, and More! The AgelessHAIR supplement is full of premium ingredients that promise to give the results women are looking for. We have always tried Biotin supplements and had good results but this product has a blend of 8 premium main ingredients! The formula is truly one of a kind because it assists with the quality of not only your hair but skin and nails as well. The 30 day supply in this one bottle was enough to see improvements in skin, becoming much softer and youthful while fingernails feel stronger and the hair is definitely softer and fuller. For the price tag of $21.97 and a 100% money-back guarantee, we definitely put this in our top 3 natural hair supplements on the market. Thank you Ageless Nutrition for making a great product that is safe to use! Proven results after 30 days of taking!